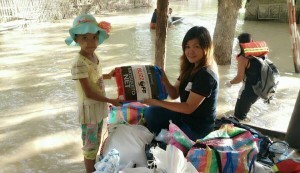 Australian Mercy’s malaria initiative Buzz Off, is providing 2000 more LLIN nets to flood victims caught up in the Myanmar floods. we are also providing funds for Rapid Diagnostic Testing kits (RDTs) as well; these will be distributed to clinics in the flood areas. Moneys that have been donated to the Buzz Off Burma Flood Appeal so far have helped to provide these nets and RDTs. We anticipate that as flood waters recede and the rainy season continues, mosquito numbers will increase profoundly as they breed in the puddles and water that is left lying on the ground. A malaria epidemic could be triggered by these floods. 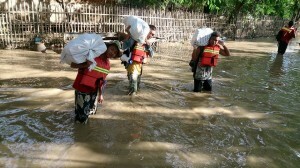 Our Burma Flood Appeal will remain open for some time, as we try to help small communities address these issues as best they can.